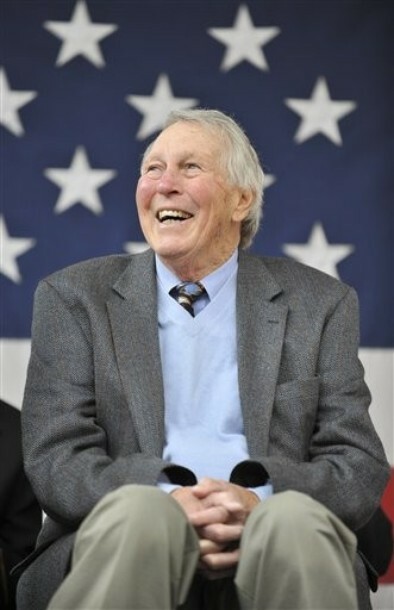 We talked about the famed Brooks Robinson statue months ago, and this past weekend all was finally revealed. The legendary Orioles third baseman (at least the bronze version of himself) has a permanent home on the plaza between Washington Boulevard and Russell Street, standing guard outside Camden Yards. 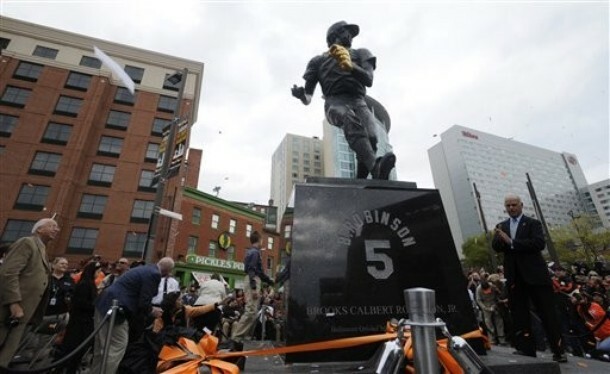 In fact, the plaza has now been renamed in his honor: Brooks Robinson Plaza. Local dignitaries, celebrities and fans came out to fete the “Human Vacuum” and his nine-foot-tall bronze twin. Governor Martin O’Malley and Senator Barbara Mikulski were among the dignitaries that spoke at the celebration. Actor and Baltimorean Josh Charles also gave a heart-warming speech, which the fans in attendance really embraced. Charles noted that for many, Robinson stood for more than just Orioles and baseball, but for Baltimore, as well. Gov. O’Malley remarked that Brooks’ statue stood at the entrance to the city for all to see as they entered. Brooks played his entire 23-year career in Baltimore, and he and his wife Connie continued to live and work in the Baltimore community after his playing days were over. Brooks has supported many local organizations and charities, such as the Zoo, Johns Hopkins Children’s Center, Little Sisters of the Poor, and the Arthritis Foundation, to name a few. When Brooks took his turn at the podium, he couldn’t hide his love for Baltimore and its citizens. “I never considered you fans, I always considered you friends,” he said with tears in his eyes. The statue depicts Robinson making a throw from third to first base and features a distinctly gold glove. It stands on a 4 ½ -foot-tall pedestal with panels describing Robinson’s storied career. The third base on the statue is exactly 583 feet from the real third base inside Camden Yards. Brooks wore number 5 for the Orioles and was inducted into The Baseball Hall of Fame in 1983, hence the 583 feet! The statue itself was fabricated in Italy by Baltimore sculptor Joseph Sheppard. The statue was commissioned by the Babe Ruth Birthplace Foundation, with principal funding from the Dorothy L. and Henry A. Rosenberg, Jr. Foundation. The next time you drive into Baltimore or go to Oriole Park, be sure to pay Bronze Brooks a visit. 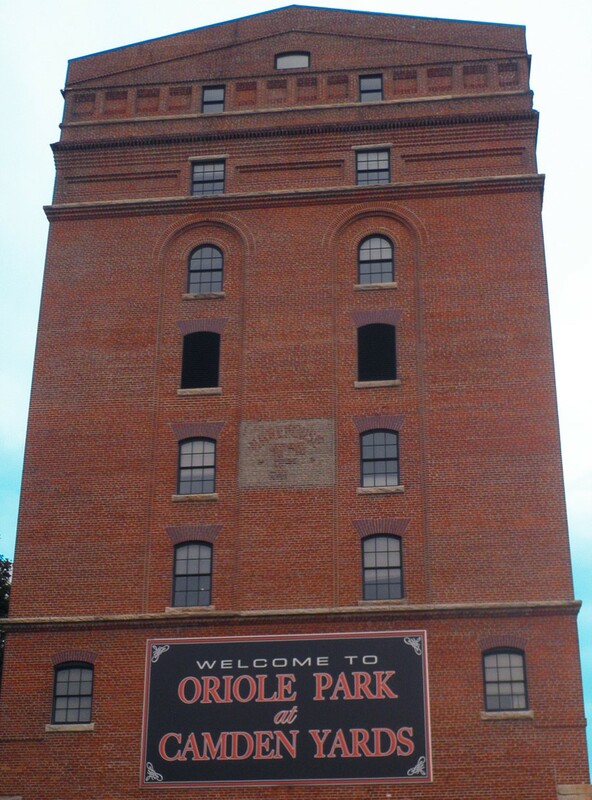 Mr. Oriole will be waiting to welcome you to Charm City.